At the close of every school term, students brood over next semester’s course selections. Evermore the neurotic endeavor, the success or failure of the upcoming term hinges upon striking a careful balance of the right classes. Navigating the process tests one’s wisdom, intuition, and tenacity. This whole drama is explicitly acted out in the cafeteria, which serves as the central meeting place for students and ideas. There, one could become an unwitting participant to passionate discussions concerning changing concentration seminars, the benefits and consequences of dropping compulsory language classes, and/or forsaking it all by taking an overload for the opportunity to study under an exceptional professor (I chose the latter). All of this excitement is compounded by some fundamental changes to ECLA of Bard’s academic policies implemented this term. The following is an account of my personal experience of this semiannual process in light of these amendments. Firstly, our school year has been resegmented. Doing away with the familiar trimester system, ECLA now follows the American two semester system. Limiting the frequency of new courses makes selecting the right classes all the more crucial. Secondly, foreign language study is now being considered for credit. In previous years, language classes could be taken as an addition to a student’s main course load; the grade you received for a language class did not factor into your GPA, but was still listed on your transcript. This change has raised quite a dilemma: do I continue with German and improve on my conversational skills or take an unrelated course that I have always dreamt about? During the first term I took two languages. After a break, I dropped German under the condition that I follow the textbook on my own or even find affordable language courses in the city, all the while committing to engage in conversations with locals as much as possible. 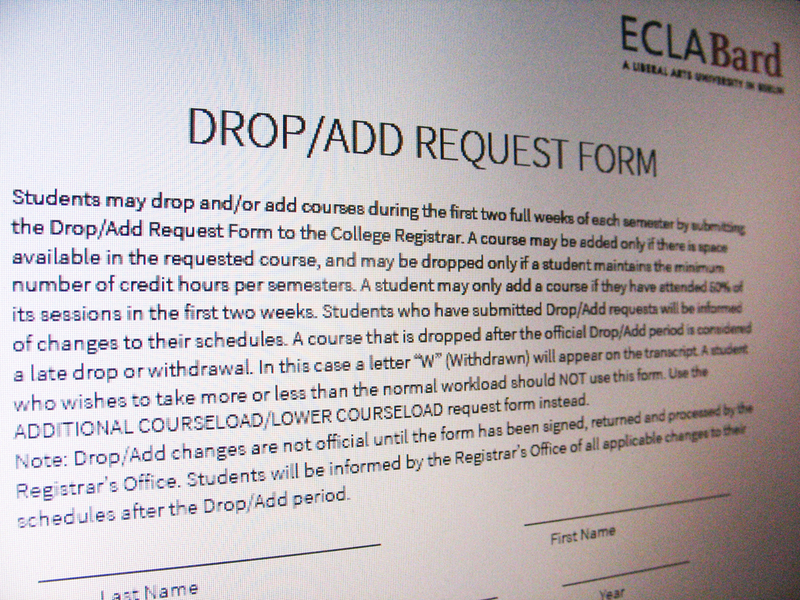 Thirdly (and finally), ECLA’s add/drop period (an initial non-committal interval of time at the beginning of each term) has been extended from one to two weeks. Consequently, during that trial period, hoards of excited students took in films, drawing instruction, foreign languages, and read on existentialism—all the while capriciously changing their plans with each passing day in an effort to determine the best classes to take. Because of these changes, the course selection process became a particular challenge for me. Being an AY student, I do not have any compulsory language or concentration requirements, which gives me a lot of freedom. However, unlike many fellow students, I did not want to go “course shopping” in order to determine the “right” course in fear of missing essential classes. My initial choice fell on Introduction to Psychoanalysis and Existentialism. However, I soon found that though I possessed a learned appreciation for psychological dramas and existential tragedies in cinema and literature, I still lacked the philosophical foundation necessary to endure these courses. As a result, I decided to concentrate on the arts, which led me to The Fundamentals of Drawing and Collage—a course that came highly recommended by David Levine, whose Studio Theatre class became essential for my understanding of contemporary performance art. And along the same vein, my previous work experience at the Kyiv International Film Festival (coupled with my insatiable interest for cinema), compelled me toward German Cinema: Weimar Republic and Third Reich with Matthias Hurst. The Fundamentals of Drawing and Collage is designed for novice beginners with a focus on basic technique and the development of artistic perspective. And I must confess here: though I have experience in many mediums of art, I have never been able to draw (my mother used to say that I would sketch a horse with the help of a ruler). Yet, sitting in that cold garage with my set of pencils, charcoal and a thick album on my lap—I felt like an artist. Though my rendition of a plastic hanger and mannequin legs was not precise, I was proud of my attempt. My sketches now adorn windowsills and Facebook walls. I even show them off to my incredulous, yet receptive family over Skype. German Cinema: Weimar Republic and Third Reich is taught by ECLA of Bard’s resident film expert, Matthias Hurst, whose cabinet holds a myriad of film treasures. Two weekly seminars are punctuated by regular film screenings, which are open to everyone on campus. The lecture hall, which houses debates over Socrates and Aristotle during the day, transforms into a local cinema in the evening, accented with heavy red curtains and a large screen. The tranquil stillness that is Platanenstrasse serves as the perfect backdrop for viewing classic German films. Taken all together, my particular course selection reflected a larger, predetermined personal ambition to become a professional art critic. Yet, in the days that pass at ECLA of Bard, I am discovering that I possess the capacity to create. There is an artist within me. Such opportunity, afforded by this Academic Year, permits me to explore interests that I never found time for previously. And with the nurturing guidance of ECLA of Bard faculty, this quiet dream of becoming an artist is being made actual. They have my eternal gratitude.